The tea bowl was made in the Song dynasty (960-1279) in the south-eastern province of Fujian and was a type of stoneware produced in vast quantities for everyday use. Its appeal is in its glaze colour and texture and in the well-potted functional form. These bowls, of which this is an exceptionally fine example, were made near Jianning, in northern Fujian, probably from about the 10th century onwards. They are especially prized by the Japanese for use in the ceremonial drinking of tea which the form and the glaze would have been considered particularly appropriate. The Japanese name 'tenmoku' is thought to be a corruption of Tianmu, a mountain close to Hangzhou from which the ware may have been shipped. 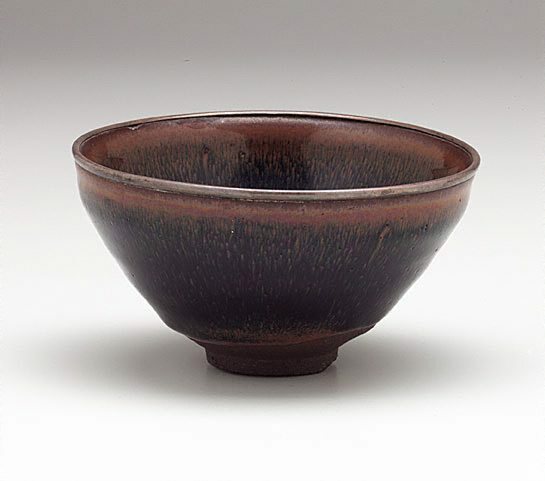 The body material is a dark brown stoneware covered in this example, with a thick, lustrous, dark blue-black glaze streaked with yellow (an effect commonly known as "hare's fur"). The colour is light brown near the mouth, having run thin there, to an extent causing some roughness at the rim. For this reason, the bowls are often metal bound, as with this bowl which has a swaged silver rim. These ferric oxide glazes were very viscous, which is indicated by the flow on the exterior, where the glaze has collected in a heavy roll some distance from the foot. J.H. Myrtle, AGNSW Quarterly, July 1965.